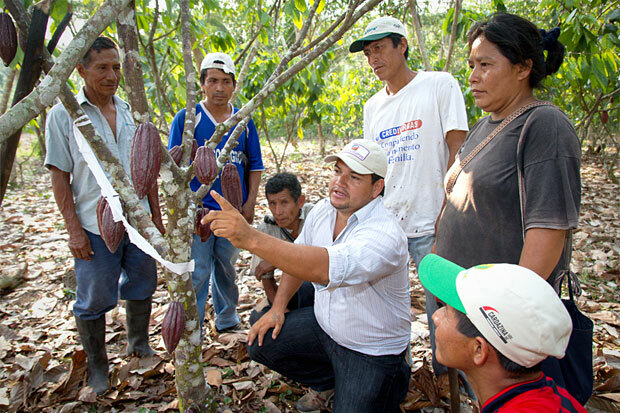 Farmers in Peru are learning improved practices and earning higher prices for their cocoa. TechnoServe advisor Nixon Rojas Sandoval talks with members of the Cocoa Producers Association of Las Mercedes in Peru’s San Martín region. Through TechnoServe’s trainings, these farmers have learned to properly prune and fertilize their trees. The farmers also improved their handling and processing of the cocoa beans after the harvest, and earned a higher price by selling their cocoa collectively. As a result, they are improving the standard of living in their community. With support from the U.S. Agency for International Development, TechnoServe is facilitating training for these and thousands of other farmers through the Economic Development Alliance in San Martín. Learn more about this work.